We live by Yosemite now, 200 miles inland, where it's colder... 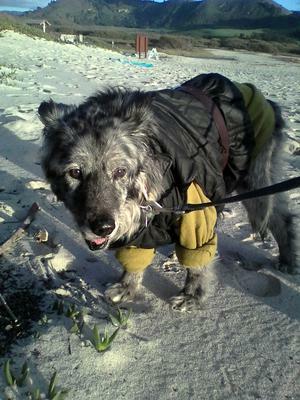 Still, I decided to see her "old" Vet on the Coast to get an evaluation of Girl-Dog's condition: some deteoriation in the hind legs, a bit of blindness... that's it. Strong Heart, lungs, beautiful teeth... appetite... yes, she's on alternative therapies for pain/joint relief (cbd oil has been the most beneficial in so many ways..) but we were told by her Awesome Vet that She's her Oldest Client and well, in amazing great health! Well, she has eaten home-cooked meals prepared by Mom her whole life, no cans (except the few months she was at the Animal Shelter... ) I bake her cookie treats, too. Rice and broth, 4 simple ingredients... No junk. She's never been sick. We both suffered thru Lyme Disease together and beat it, too, though it took several years, with alternative therapy. A Girl Dog like this is the most awesome Gift ever; so I am gifting her back by Honoring her with full time care, because she needs a little help getting up or down... she needs to move/walk/pee every 4 hours or so... She is my own Elder Baby now... She needs Guidance when Outside. Now I am her Guide when she's been mine for so long. I forgot to mention, the referral to a cool Chiropractor sealed the deal for her... She was in extreme pain over dislocated spine... torn ligament... now She's almost walking normally again!... we figure she's like 150 years old? Her Chiropractor costs twice my own does. Go figure. We created a Go Fund Me campaign for Her to Show the Love we have for her Awesomeness... and to help address some of the bills we're incurring... Do you know of a Healthier, Longer-Lived Aussie? I don't. And I cannot "put down" such a healthy creature just because she's needs more attention now, it's not convenient at 3 AM but she's been worth it. I've adjusted my attitude. It has been my discovery that Aussies are not only the Best Dog Ever; People-Who-Love-Aussies are really Awesome too. Comments for SuperNova, The Healthiest Elder-17 You've Ever Seen! I'm so happy to hear of an Aussie that is farther along in years than our two black tri Aussies were. Both of our Aussies died at the age of 11 years from liver cancer. We missed them so much but have their ashes on our piano. We now have a red merle Aussie who is seven. We are feeding her according to our vet and hope she will live past our others. She is a spirited Aussie, more than the other two, and enjoy doggie day care , outdoors, walks, and dog parks which is all we can offer her at our age. We know Aussies are the best dogs ever. We are amazed at what our Jodi understands and communicates.